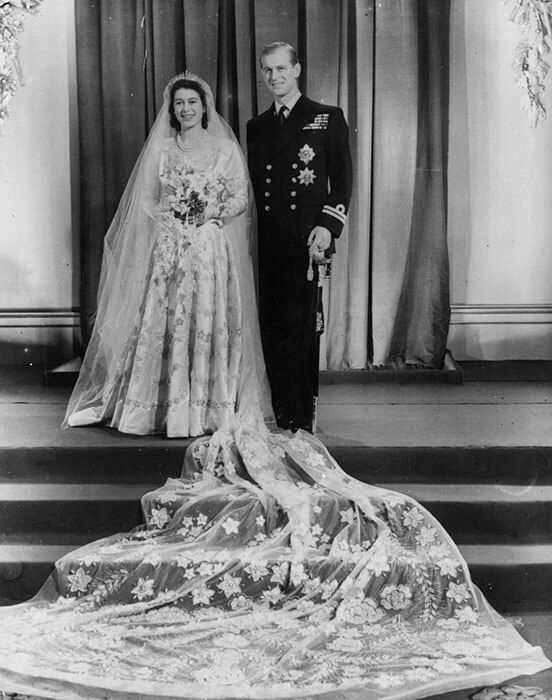 Yesterday was the 67th anniversary of the Queen of England and her husband, Prince Philip, The Duke of Edinburgh. WOW. 67 years. She was 21 and he was 26 and it was just after WWII. Who would’ve thought they would live such a long and healthy life? She’s 88 and he’s 93. I think that’s awesome. They married at the spectacular Westminster Abbey. She had 8 bridesmaids. The ceremony was at 11:30 am. and she wore a gown designed by Norman Hartnell. Since the country was still under the rationing of the war time, she was allowed, by the government, 200 extra clothing coupons to be able to have the dress of her dreams. Many brides-to-be across the country mailed her their coupons for this purpose as well but she returned them all. The wedding breakfast was filet de Sole Mountbatten, Perdreau en Casserole, and Bombe Glacee Princess Elizabeth- (filet of Sole, partridge in a casserole, and ice cream) – The wedding cake was nine feet tall with four layers and cut with the Duke’s sword which was a gift from King George IV, her father. « Lavada Dee and Bahamas Christmas! Ahhh, I’ve never read about their wedding day before, so appreciate this Friday fact. Long live the Queen and Prince! Thanks Laurie. I hope they keep going for many more years. I’ve enjoyed seeing pictures of Queen Elizabeth in her young years. She was and is quite the woman. Another reminder that we aren’t born 50, 60 or ? For sure, Lavada. She is a lovely woman now as well as then. Very pretty.